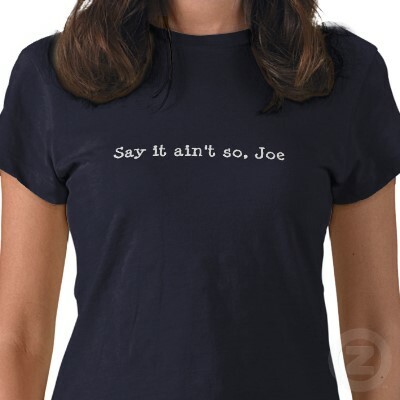 Writing in the Sunday New York Times, Anand Giridharadas notes that the word "so" has replaced the ubiquitous "well" and "um" as the new oral connective tissue. Giridharadas claims that these uni-syllabic forms are "no longer content to lurk in the middle of sentences, (they have) jumped to the beginning where (they) can portend many things: transition, certitude, logic, attentiveness, a major insight." And citing a report on NPR, Giridharadas says that fully 25% of the sentences in the report began with the word "so:"
"So it's, I think, the fifth largest in the nation. So, but now that's the population in general. So there are sort of two, there are two things that are circumstantial..."
I thought the Times might be exaggerating. The report seemed to take the "so" sentences out of context and string them together to make a point. In fact, the Times was pretty accurate. The story referred to a broadcast conversation between Michel Martin, host of the program "Tell Me More" and NPR's correspondent in Arizona, Ted Robbins. It aired April 23, 2010. MARTIN: So, Ted, I wanted to ask you, how is the Hispanic vote playing out in regard to this measure? As I understand it, some 30 percent of the population in Arizona is Latino. ROBBINS: That's correct. So, it's, I think, the fifth largest in the nation. So, but now that's the population in general. So there are sort of two, there are two things that are circumstantial, there are circumstances and there are things within Hispanics' control that are affecting the situation. The things that are circumstantial are the fact that a larger than general portion of the Hispanic population in Arizona is under 18. So, of course, they can't vote. And then there's also a lot of folks who are in the country either legally or not legally, but they can't vote because they're not citizens yet. So, if you pair them away, what you have is 17 percent of eligible voters are Hispanic. That's of the whole population. So they don't, you can see that that halves the number of total Hispanics in the state. So the numbers belie their electoral power. MARTIN: Well, 17 percent is not an inconsiderable number. I mean, you can be a swing vote with 15 percent if you vote as a block. So, I wanted to ask, what impact does the Latino vote have on the politics of the state at this moment...? This is surprising since NPR has a very strong tradition of producer control over all content, with the exception of live-to-air broadcasts. This type of conversation, also known as "two-ways" between host and reporter are usually pre-recorded. The producer with her/his acute sense of hearing and "radiocity" doesn't hesitate to intervene to tell the host to do it over. The rough recording is then edited into something considered "airworthy." But obviously, not in this case. The producer presence seems to have been missing. Another auditory annoyance on NPR and increasingly on CBC Radio is the "glottal fry" also known as "creaky voice." This is speech therapist or voice coach lingo for a tightening of the larynx which produces a raspy quality to the voice. I hesitate to mention this, but it seems to occur more frequently among female reporters than male. One possible explanation: the pressure on radio reporters to sound "authoritative" (aka, male). This can also be cured by solid coaching. Remediation is easy. Once pointed out to the reporter, it usually disappears within days. One explanation for it: new reporters often tense up before delivering a script; they calm down once they are in mid-delivery; they tense up again at the thought of ending the script on time. 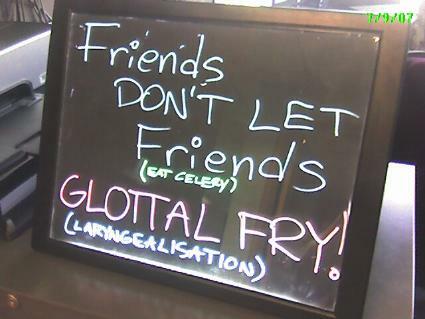 Hence the increased presence of "glottal fry" at the beginning and at the end of the story. The increased presence of the "glottal fry" is, I fear, a result of the absence of performance training inside many broadcast operations. In paring budgets, one of the first things to go is staff training. It is cheaper to contract it out. Unfortunately, once the training budget is gone, it rarely returns. And bad habits tend to be viral: when one high profile journalist has the malady, the infection spread as others quickly adapt and imitate.